The Dream Nursing Tank is the ultimate nursing bra and tank in one that provides full length style and full time support. This tank is perfect for wearing at home or on-the-go, whether you're pregnant or nursing. You can opt to wear it alone with your favourite jeans or under a sweater with a cozy pair of leggings. Please note: this item is final sale and non-returnable. I find this top very flattering, but as others have said I recommend sizing up to avoid it riding up. My biggest issue is the snaps - they are tricky to unsnap with one hand - something that would be handy when you're using your other hand to hold a hungry baby! I like these but they are pretty snug fitting, not like the picture shows unless you size up. Buy more than one! I have worn this top every day since my daughter was born 8 months ago. Great for nighttime, but you can also wear it under regular tops: Just pull out up the outer top to breastfeed and your stomach remains covered up. Very practical and comfortable. With my first baby i bought cheaper tops, but these are very much worth the extra money. My only complaint is that, for me, the elastic rides up. A must - have for breastfeeding mamas! I own one in every color. By far the best nursing tank on the market. If you don't fit the s/m/l category like I imagine most people don't and want a supportive yet comfortable tank then this is the one you want. Worth the price! No complaints so far. I love this top! Its comfortable and functional. The only thing is that I bought it at the same time as the "clip and pump hands free nursing bra accessory" and that only works with type b clips which this top does not have. Such good quality. The cut is flattering to cover those last bit of pregnancy weight I need to lose! The most amazing nursing tank on the market. I live in these tanks day and night, wear them on their own and layer them under tops. Comfortable, supportive, flattering! My favourite nursing tank - the most flattering, most supportive, durable and comfortable. Worth the money. Best nursing top. Very comfortable and soft. Love this tank, it has removable bra pads so there's no worry of leaking through! Very comfortable. Even though this tank is characterized differently than the other Bravado tanks, the only difference I really detect is that it comes with bra inserts. 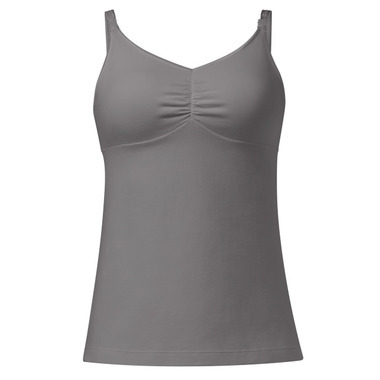 The fabric is no softer and it is not noticeably longer or more shapely than the other, slightly cheaper tanks. I like it, but was a bit disappointed.